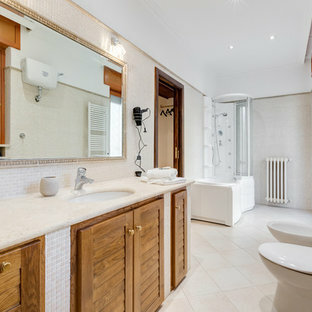 Scopri su Houzz la più vasta collezione di foto e idee per: Doccia idromassaggio. Sfoglia 123 foto sul tema e lasciati ispirare per il tuo prossimo progetto. 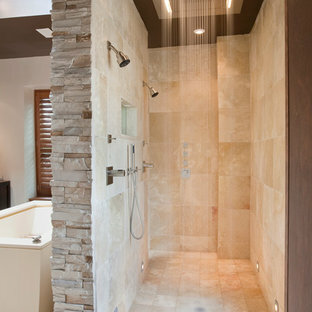 The epitome of relaxation, this shower offers the answer to day-time stress! 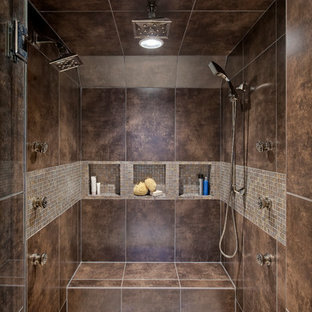 With 6 body sprays, fixed and hand-held shower heads, as well as a rain shower head and steam unit, this homeowner can wash away the tensions of the day. 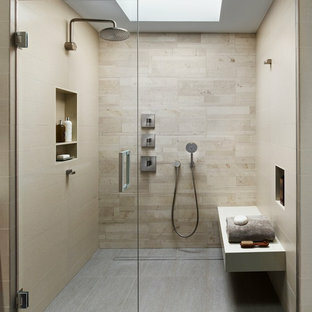 Easy to clean, large-scale porcelain tile walls, along with the pebble shower floor and glass mosaic tiles, add to the ambiance of privacy and luxury. 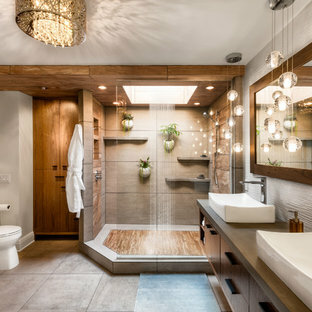 Custom master bathroom with large open shower and free standing concrete bathtub, vanity and dual sink areas. 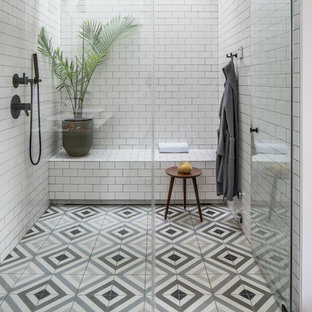 Shower: Custom designed multi-use shower, beautiful marble tile design in quilted patterns as a nod to the farmhouse era. Custom built industrial metal and glass panel. Shower drying area with direct pass though to master closet. Vanity and dual sink areas: Custom designed modified shaker cabinetry with subtle beveled edges in a beautiful subtle grey/beige paint color, Quartz counter tops with waterfall edge. Custom designed marble back splashes match the shower design, and acrylic hardware add a bit of bling. Beautiful farmhouse themed mirrors and eclectic lighting. Flooring: Under-flooring temperature control for both heating and cooling, connected through WiFi to weather service. Flooring is beautiful porcelain tiles in wood grain finish.